Canadian rock band, formed in 1995 and fronted by Chad Kroeger. 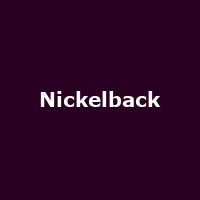 One of Canada's most successful ever bands, Nickelback have sold around 45 million albums and scored worldwide hits with tracks including 'How You Remind Me' and 'Rockstar'. Albums include their 1996 debut "Curb", plus "The State" (1999), "Silver Side Up" (2001), "The Long Road" (2003), "All the Right Reasons" (2005), "Dark Horse" (2008), "Here and Now" (2011) and 2014's "No Fixed Address".